There is a temptation to try and make everything match perfectly when it comes to wedding jewellery but really there are no rules. The first piece of wedding jewellery you are likely to receive, your engagement ring, you may have little or no prior knowledge of or control over and it will of course be a hugely sentimental piece. In contrast, it is likely that the process of choosing a wedding ring to compliment your engagement ring will be enjoyed together. There may already be some subconscious idea of what the wedding ring should look like but it is worth remembering that the two are entirely separate pieces which symbolise different things. While there are some practical things to consider the most important thing is that you love your wedding ring entirely and that you enjoy wearing it every bit as much as your engagement ring. It is often advised to choose a wedding ring similar in width to your engagement ring as neither should dominate but the wedding band does not have to be plain or simple. There are actually wedding rings in endless styles to choose from and there is the possibility of creating your own bespoke designs using our CAD (Computer Aided Design) service and being part of the design process will guarantee that you will love the results. Another idea for creating your unique piece is to have a special engraving inside the wedding ring be it a personal message, simple initials or the date of your wedding day which adds another layer of deep meaning to your wedding ring. What wedding ring suits your style? 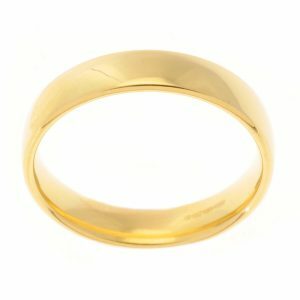 Gold or Platinum wedding rings are available in any size, width and in 9ct, 18ct gold or Platinum and they may be hand engraved with a message of your choice to make them unique. stones or one set with larger stones in another way there are lots of different opportunities to have a wedding ring with added sparkle to enhance your engagement ring. 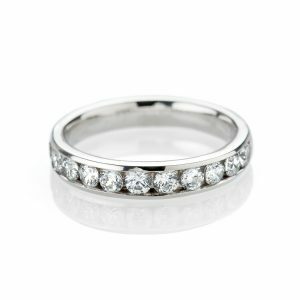 Today the vogue is to combine the wedding and eternity ring as one ring which allows such variation and added sparkle to the engagement ring and gives a sleek more minimalist feel too. Inspiration awaits you at Heidi’s Mill Street Showroom but below you will see a varied selection of rings which may suit your tastes. If your engagement ring has one large centrally set stone you may need a scalloped or shaped wedding ring to perfectly enhance your engagement ring. The Exquisite diamond and 18ct gold crossover ring below is a perfect example of this as is the delightful diamond set wedding ring. This bespoke diamond, blue sapphire and 18ct gold ring is simply stunning and perfect to accompany an engagement ring with perhaps a matching coloured gemstone. 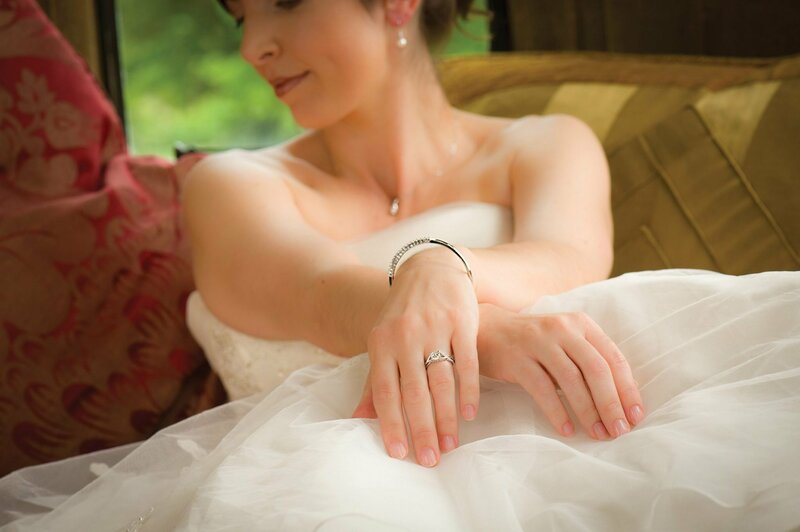 Please do call in to our Mill Street, Oakham showroom or email heidi@heidikjeldsen.co.uk to enquire about our wedding jewellery and discuss your requirements. We look forward to welcoming you soon.